Choosing the right type of diy flooring ideas for your home can be tough because of all the options available. Because of the variety of materials, colors, and patterns of floors to choose from, it is important to research the best type of floor to use for each room. Different rooms of the house have different functions and needs. For example, kitchen and best bathroom flooring tiles call for material that is moisture resistant because water and other types of spills are more likely in these rooms. Likewise, kitchens and living rooms will have to have durable materials because they are high traffic areas of the home. Because there are so many different considerations to think about when choosing the right material it is best to pick a type that is multifaceted. 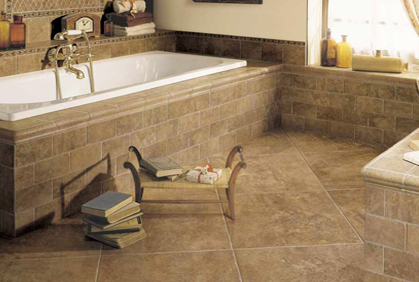 There are many different types of tiles to use for various flooring projects. 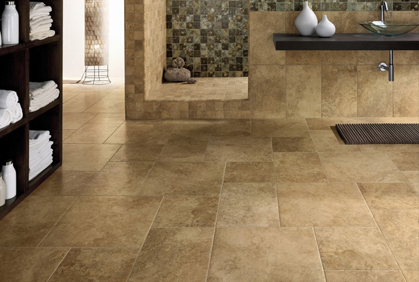 Tile can be made of ceramic, porcelain, marble, wood, vinyl and laminate, each of which are better for different rooms. Porcelain and ceramic floor tiles are common for kitchen and bath because they are very hard and can withstand water spills. 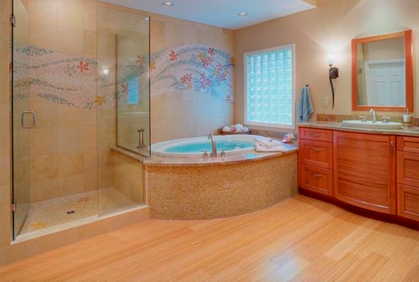 Tile is one of the most popular materials used for bathroom flooring jobs. This is because tiles are durable and moisture resistant so they can withstand the everyday ordeals associated with bathroom use. 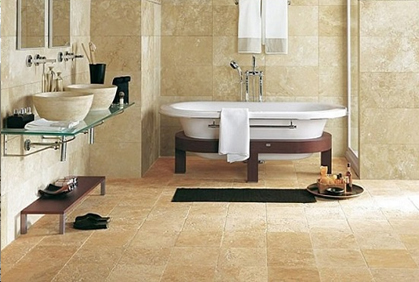 Ceramic and porcelain floor tile is one of the most commonly used tiles in the bathroom. They come in a variety of different colors, sizes, and patterns so they can be used for any bathroom tile designed floors. 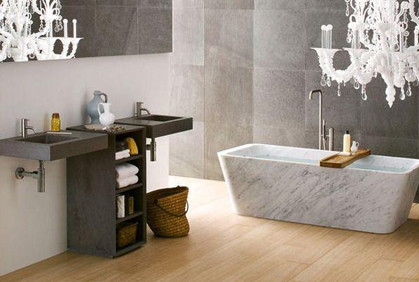 Another option for tiling is marble flooring tiles. Marble is a great choice for flooring because it is naturally strong and durable. It comes in various different colors and floor tile patterns and the type of marble you choose will depend on what room of the house it is going to be installed in. Marble is ok for kitchen flooring tiles however it is best used on kitchen counters. Marble is prone to staining because it is very absorbent so it must be sealed in order to prevent unwanted stains. In addition, it can be scratched easily in high traffic areas, like the kitchen, so it is better used as floor tiles in the bathroom. Marble is very tough and durable, however, it is often very expensive. Wood flooring tiles make installation of hardwood floors easier. These tiles often have puzzle piece like grooves that help them to fit together quickly and easily. In addition, because of these groves they click together, letting you know that they are secured and making installation a breeze. Wood floor tiles are the best option for inexperienced DIY homeowners to install a wood floor themselves. There are also wood flooring deck tiles that can be used to remodel your deck or porch easily. They are the perfect option for a quick touch up to your deck floor because they are easy to install. The tiles have connecting tabs built into them so that they form interlocking tiles that connect to each other to stay in place. Laminate can be made to resemble wood or other types of tile and can have various colors and designs. This type of tile is durable and moisture resistant, making it a great option for kitchens and bathrooms. 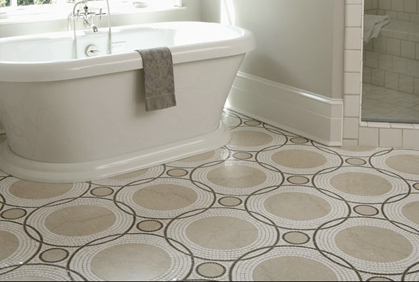 Vinyl floor tiles are another great option for low priced flooring. Vinyl tiles are made from plastic and polyvinyl chloride, or PVC. These tiles come in many different designs and colors and can be plain colors or are made to look like materials such as wood, granite, or brick. Vinyl is also moisture resistant so it is good for use in areas prone to water spills. The downside is that vinyl can tear easily so it is not as durable as other materials. Linoleum floor tiles are also an inexpensive option for flooring. Linoleum is made from a combination of natural substances such as saw dust and linseed oil that is shaped into thin tiles. These tiles are waterproof and come in various colors and textures. Not only are all these materials low priced, but the flooring installation is not difficult. These types of floor tiles are best for DIY homeowners because laminate, vinyl and linoleum can be quickly and easily installed even by inexperienced homeowners.